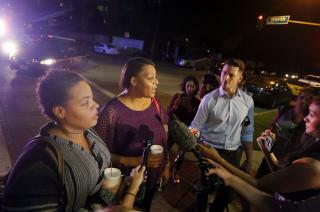 (Newser) – Five police officers are dead and at least seven were injured after a shooting in Dallas Thursday night during a rally against police brutality, but at least one civilian was also injured during the attack—and she was hurt while trying to protect one of her children, her sister tells the AP. Theresa Williams says her sister, 37-year-old Shetamia Taylor, had taken her four sons, ages 12 to 17, to the protest in downtown Dallas when gunfire erupted and Taylor's motherly instincts kicked in. Good job mom. Prayers for you and your family. Hope you fully recover. Kudos to the Mother. People are so busy posting comments off topic they ignored the article. Shetamia and Theresa? Makes me wonder if they share the same father and mother. I mean, honest to god, that's like naming your twins Bob and Lancelot.